Glengoyne has released quite a few fancy bottlings since Ian Macleod Distillers acquired the distillery in 2003, and this one is no exception. It comes in a gold safe, upright fish tank, chipmunk/squirrel/mouse trap-type of container complete with a lock, keys, and a velvet pouch to hold them. 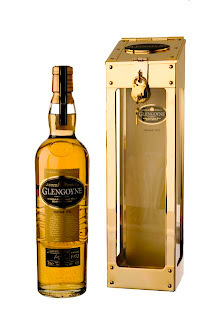 The label is gold and the whisky in the bottle radiates in the precious metal of its surroundings. I cherish every time I get the opportunity to drink a whisky that is older than me and unfortunately, I can't help but notice that these opportunities come less and less often. It is probably part of the reason why the traditional market for scotch whisky is older folks cuz at least they appreciate 10, 12, 21, 30 years of maturation. Like I said back at Malt Mission #145 the integral role maturation and age plays in scotch whisky could lead one to believe "that people shouldn't be allowed to drink whisky older than themselves because they simply won't have the perspective to appreciate it. Does a 21 year old really understand what 30 years feels like? I do still find it such a romantic feature of scotch malt whisky that it can condense time in a glass, bringing decades [and in some cases] generations of family together. Gotta respect that." From tragedies like Bloody Sunday in Derry, Northern Ireland, the Black September group plane hijacking and the Munich Olympic Games hostage crisis, to the beginning of footwear and video game empires(Nike sold their first shoe and Atari released PONG), to unprecedented national pride in sport as Canada beat Russia in the Summit Series, here's to 1972. In the whisky experience, it can be true that "All ages are contemporaneous" (Ezra Pound). Time travel in a glass. Magic. Big thanks to Iain and Alison for sharing the sample. For more distillery info and stuff, see the other Glengoyne's we've had on the mission HERE. Light and heavy, sweet and bitter, great display of balance right off the top. Malt and peach and pineapple and oak. Banana foamies. Fruit compote with fresh cream. Wooden spoons. Slippery in the mouth with all the fruitiness of the nose controlled against oak and spice, as well as a touch of what I would swear was smoke. Grapefruit, fennel toothpaste, vanilla sauce and blueberries. Grist and oak, nutty and candied through the medium-long finish. Impeccable balance and charm, and a wonderful exhibit of successful maturation. Older doesn't always mean better. 35 years old and not in the least bit tired. No indication that this is the product of one cask... is it? Great gift from the wealthy to the fortunate (and in some cases they might be the same person). In a different league in terms of style (neither better nor worse) from the 17 or 21yo, this release shows another, and equally enjoyable, side to the Glengoyne style.